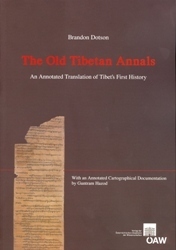 The Old Tibetan Annals contain Tibet´s oldest extant history. Primarily a bureaucratic register of events, it is the single most reliable source for the history of the first half of the Tibetan Empire (c. 600–850 CE). This record was maintained more or less contemporaneously with the events it describes, with entries added at the end of each year from 650 to 764. In each yearly entry, the Old Tibetan Annals record information such as the summer and winter residences of the Tibetan emperor, where the summer and winter political councils were convened, who convened them, and what measures were taken. Visits from foreign dignitaries, military engagements, dynastic marriages, the birth of a future sovereign, deaths of important figures, and the performance of funeral rites for the royal family are also recorded. This volume offers an annotated translation of the Old Tibetan Annals along with a transliteration of the Tibetan text and photographic reproductions of the original Dunhuang documents. A long introduction serves to place the Old Tibetan Annals within its cultural and historical context by exploring the history of the Tibetan Empire, as well as its political geography and administrative practices. A set of appendices follows the translation, of which an index of the place names mentioned in the Annals is especially useful. The indices and a glossary render the Annals easily accessible, and the photographic reproductions give scholars access to the original text.